Hard Rock Cafe KOBE 2003 KISS SERIES ACE FREHLEY. In Space Suit with Guitar. KISS guitarist Ace Frehley wearing space suit and playing Les Paul guitar! Silver base metal pin (PIN USA) is 2" x 1 1/8" - tacs back. 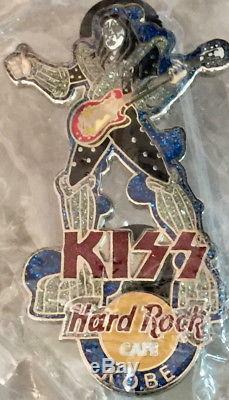 The item "Hard Rock Cafe OSAKA 2003 KISS Band PIN ACE FREHLEY Space Suit LP Guitar #20356" is in sale since Saturday, April 28, 2018.